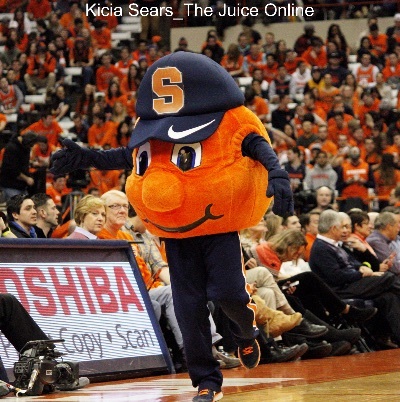 Rakeem Christmas has been the clear driving force for Syracuse this season. The senior center is a load in the post, scoring nearly at will, cleaning the glass, and providing a solid backbone to the team’s 2-3 zone. 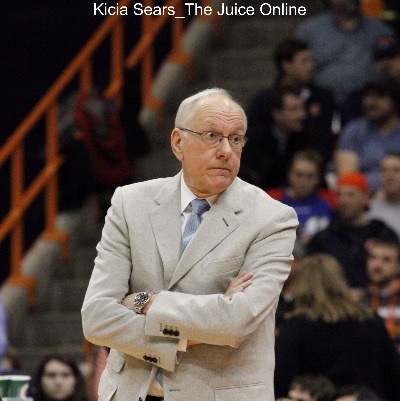 However, he’s not the only reason this Orange team is hovering above .500 in ACC play, even with a depleted roster and limited rotation. While SU also depends on Trevor Cooney for some much-needed perimeter shooting for both simple firepower and to open things up for Christmas, Michael Gbinije has evolved into an all-purpose player who is simply one of the best in the ACC and should be named to one of the all-conference teams. I know, this sounds like a puff piece on a team fan site, simply trying to blow smoke and get a player some undeserved credit. And Gbinije was mostly an unknown quantity for the Orange, a player who came off the bench last season and was asked to be the square peg of a small forward being jammed into the round hole of point guard. The ACC’s website lists rankings for 13 statistics for conference games only. Three players are ranked (top 25 for points and rebounds, top ten for other categories) in seven categories, the most among all players. Two are the aforementioned Rakeem Christmas, who has worked his way into being a shoo-in for First Team All-ACC, and Montrezl Harrell from Louisville, who was preseason all-conference and a potential All-American. Gbinije also just misses the cut in assists per game, as his average of 3.9 per game is just shy of 4.2 per contest, which is the cut-off for tenth place. 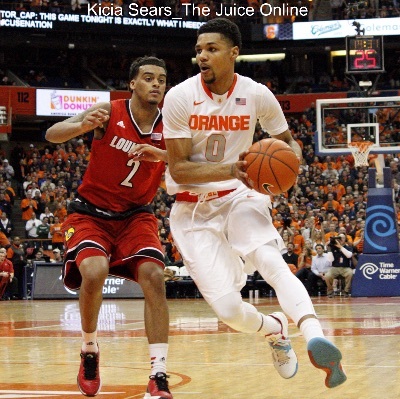 In short, in the ACC toolbox, Gbinije is the swiss army knife. As an additional point of reference, those two big men, Christmas and Harrell, get to triple-dip in stats for rebounds, as the conference provides rankings in total rebounds, offensive rebounds, and defensive rebounds per game. Duke’s Jahlil Okafor and North Carolina’s Brice Johnson, two of five players to be ranked in six categories (Quinn Cook of Duke, Jerian Grant of Notre Dame, Olivier Hanlan of Boston College are the others), are afforded the same luxury as an interior player. As has been pointed out in many circles, including by his own coach, Gbinije has even been in a slump the last few games. He has averaged 11 points, 5.3 rebounds, and 3.3 assists on 27.1 percent shooting from the field and 20 percent on threes over the last four games, three of them losses for the Orange. Before that, he was making 51.4 percent of all his field goals, including over half of his triples, in conference play. Those marks would be fifth and first in the ACC rankings today. Gbinije is also fairly consistent, logging double digits in scoring in 15 of 17 ACC games to this point. Even when he has fallen shy of that mark, he has scored eight and nine points in those contests. While Gbinije is not a perfect player, he has been improving on one of his biggest flaws in recent weeks. He is shooting 61.1 percent from the foul line in conference play, but has made 77.4 percent from the stripe in his last seven games, in part due to a stripped down routine where he has eliminated dribbling. Now, statistics are not the only way to measure individual players’ contributions and there are factors that affect the statistics themselves. They are enhanced or lessened by the team the player is on, their style of play, and so on. Virginia, for example, has already locked up the conference regular season title. Their top scorer, Malcolm Brogden, ranks 20th in ACC play. Three different Syracuse players are ahead of him. In fact, no Cavalier appears on the rankings in more than two categories. Yet, they’re 16-1 in conference play with their patient, defensive-minded style that slows the game down, preventing their players from amassing impressive numbers. Frankly, using those categories to deduct points from Gbinije’s candidacy is simply looking for a reason to not vote for him instead of actually deciding if he merits inclusion among the conference elites. There are excellent players in the ACC. Michael Gbinije is certainly among them.